Imagine doing a Magic Squares routine but not having to remember any numbers or do any math? This is Chris Randall's unique and entertaining take on the classic effect but using celebrities instead. A spectator is asked to freely choose a celebrity. The magician then claims he knows the celebrity the spectator has choose. The magician takes out a pad of paper and begins to draw a grid of 4 x 4 squares. He then fills in the squares with some of his guesses of who the selected celebrity is. After filling out all of the squares he asks the spectator if their celebrity is on the grid. The spectator replies with a firm "NO!" The magician still assures them he knows who it is and will prove it. We won't bore you with the details (you have to buy the book to learn those) but by the end the audience is laughing and you have indeed determined their selected celebrity. Chris has done all of the hard work for you and has included his handling, ideas, and experience with this effect in this booklet. 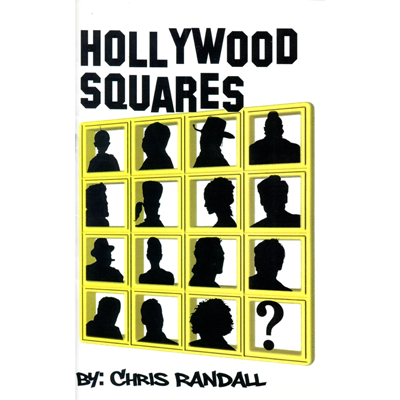 With Hollywood Squares you will always be one step ahead of your audience and 6 degrees away from and a good time.